Home > Medals > Medal "For the Wedding of Prince Ferdinand I and Marie-Louise"
Medal "For the Wedding of Prince Ferdinand I and Marie-Louise"
Obverse: The effigies of Prince Ferdinand I and his spouse – Princess Marie-Louise of Bourbon-Parma circumscribed with the text: “ФЕРДИНАНДЪ I. КНЯЗЬ БЪЛГАРСКИЙ. МАРИА ЛУИЗА БУРБОНСКА ПРИНЦЕССА ПАРМСКА“ / translation: Ferdinand I. Knyaz (Prince) of Bulgaria. Maria Louisa of Bourbon Princess of Parma /, and a tiny five-pointed star at the bottom. Reverse: Upon a decorative element with imbued torch, two shields bearing the coat of arms of the two newlyweds, jointly crowned with the Bulgarian royal crown with elevated and embowed lappets. Across the decorative element is displayed a scroll, bearing the motto “ВѢРNОСТЬ И ПОСТОЯNСТВО“ (the Cyrillic letters ‘H‘ replaced with the Latin “N”), meaning ‘Fidelity and Continuity’. Circumscribed are the dates of the wedding ceremony (8th April) and the date of the arrival of the royal couple in Bulgaria (30th April), with the year 1893 inscribed at the bottom. 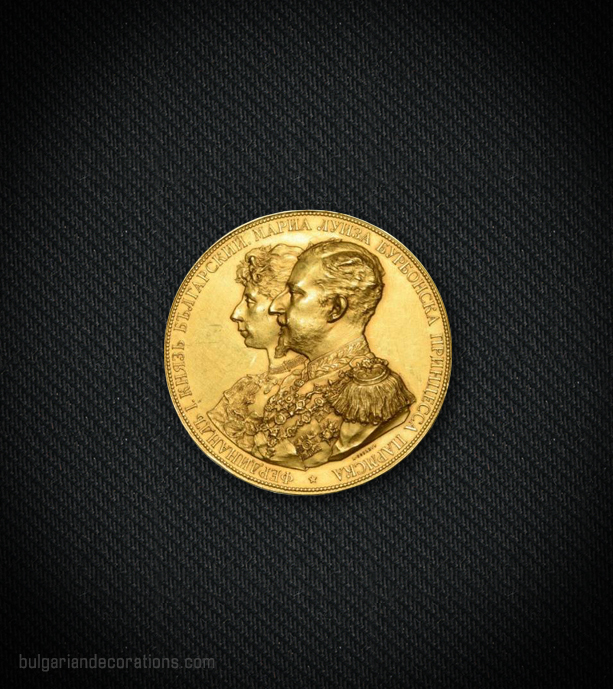 The commemorative medal for the royal wedding has been instituted by the Monarch in the first days after His arrival back to Bulgaria as a married man. 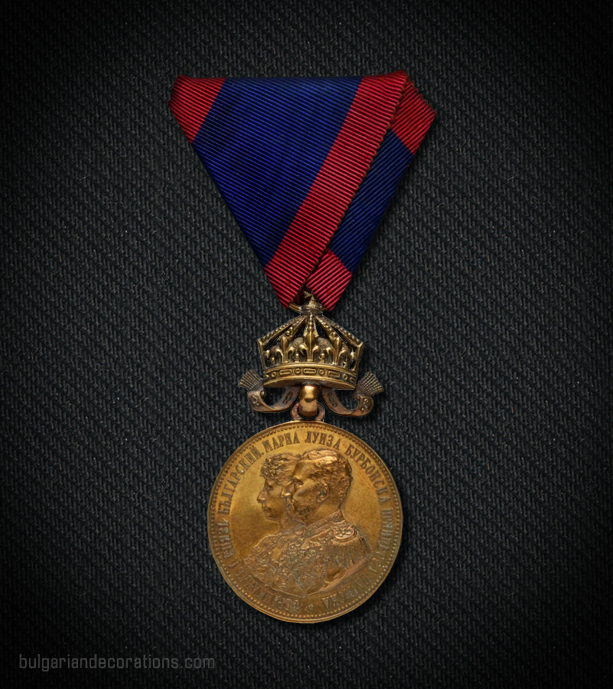 In total, more than 6 000 pieces of this medal have been minted and awarded, plus an unknown number of non-official decorations, dedicated to the same occasion, which suggests that the government and HRH The Prince have intended to spread the great news not only to all Bulgarian citizens, but abroad as well. It has been minted in three classes – gold (in fact gilt), silver and bronze, the latter two being awarded with or without crown suspension. The golden class has been awarded to few senior Bulgarian statesmen and to foreign nationals, members of other European royal courts. 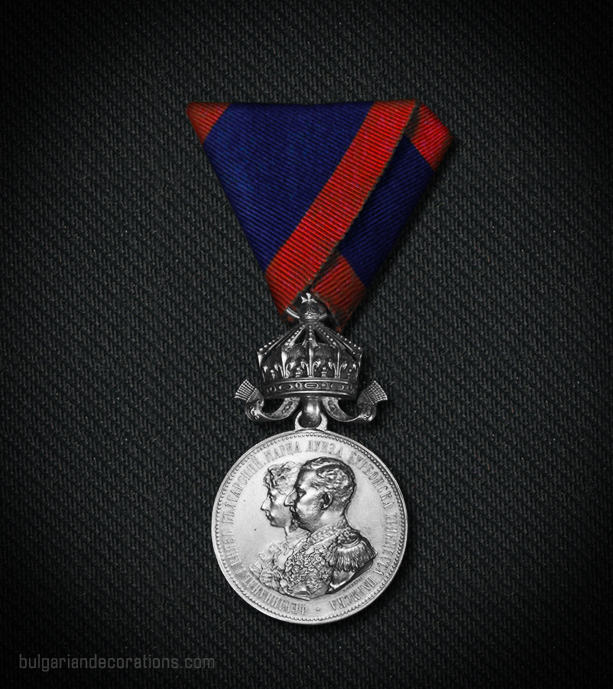 The silver medal (with crown) was bestowed upon senior governmental officials (ministers and alike), archbishops, army generals/senior officers and foreign nationals. The silver medal without crown suspension was being given to members of Parliament, army officers, regional governors and officials who greeted the newlyweds on their way to Sofia. The bronze medal with crown is probably the rarest of these. It has been awarded to a very small number of lower-ranking members of the Prince suite. 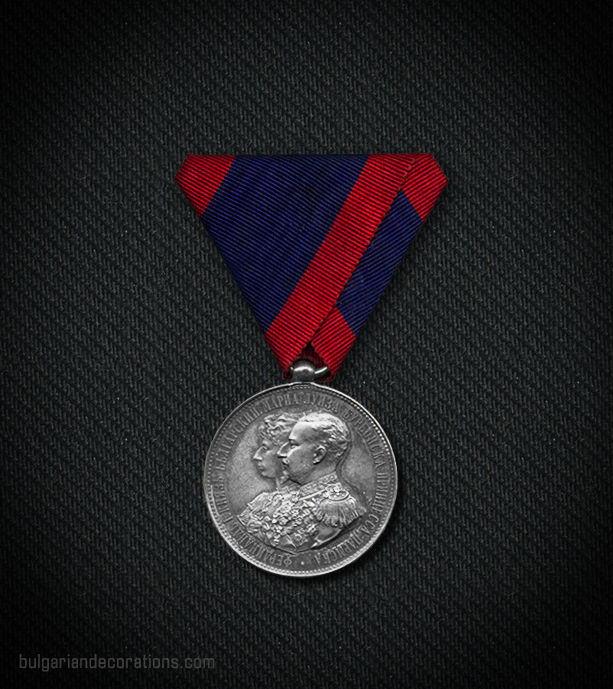 The bronze medal (without crown) was the most common variant of this medal. It has been received by a wide variety of mid and low-ranking governmental or army officials, ranging from municipality mayors, through army NCOs, down to mayors of small villages, through which the Prince and Princess have passed while travelling the country. 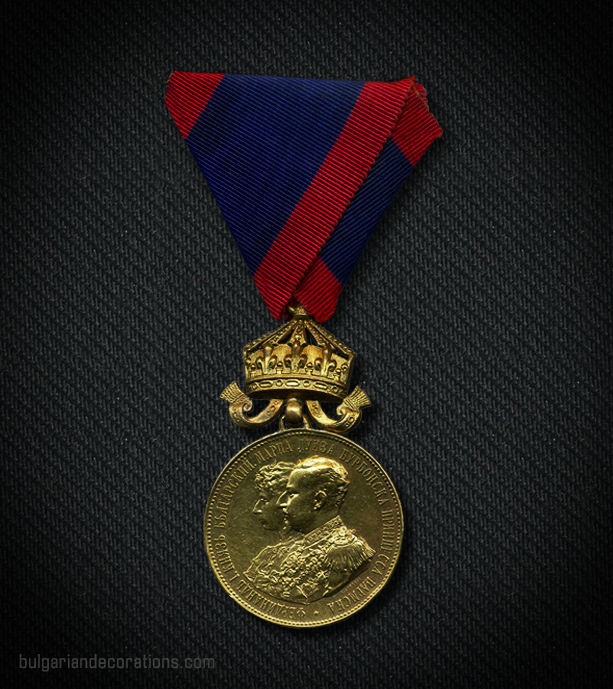 All the elements of the medal has been thoroughly designed (probably by order of the Prince Himself) with the contemporary European standards. 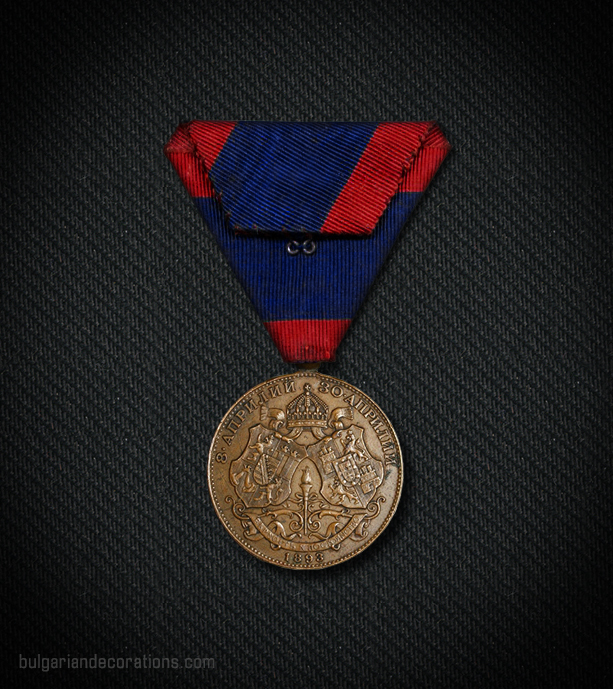 The engraver of the medal was Anton Scharff and the production was delegated to the famous Viennese company of Rothe & Neffe. 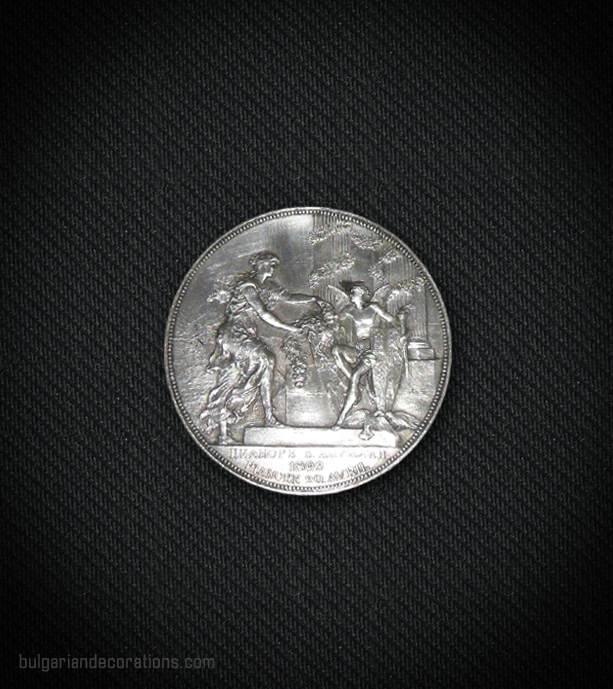 There are also slightly larger table-top variations of this medal with different image on the reverse. These, however, have only been awarded to a handful of people and thus the purpose/merits for the decoration with these remains unclear.